The Gervais School District may be one of the smaller districts in Polk and Marion counties, but the community surrounding it is anything but diminutive. Last week, Gervais Elementary School was awarded a $1,000 grant for its music program, the culmination of a viral social media voting campaign that saw Gervais beat out dozens of schools from much larger surrounding districts. GES was one of 10 schools to receive a grant in January from the Maps Community Foundation, the charitable arm of Maps Credit Union. Each year, Maps holds its Teacher Grant Program, awarding $10,000 to teachers in Marion and Polk counties. Teachers apply for the grant online, stating a specific goal they would like to address should they receive the award. Community members are then asked to vote for the projects they like best, and the 10 projects that receive the most votes get the grant. Some teachers asked for funds to send their class to OMSI for the day, others sought funds for starting a coffee stand or purchase new tools for biology class. At Gervais Elementary, first-year music teacher Courtney Karns wanted new Orff instruments. A member of the percussion family, Orff instruments, named after Carl Orff, include xylophones, glockenspiels, marimbas, metallophones and more. They feature removable bars and resonate music when struck by a mallet. They are popular with children, but also relatively expensive as far as instruments go. "When I came to this school, I noticed that we didn't have quite as many instruments and a lot of the instruments we had were really old and kind of in disrepair and it just makes it harder for the kids," Karns said. "They can't read the letters on the bars, or there's bars missing." At the very least, Karns wanted to at least make sure the classroom had enough Orff instruments so that each child could play their own, but there simply wasn't money in the budget to make those kinds of purchases. Karns began looking into grant opportunities around the region. She was used to applying for grants at her previous teaching position in Texas, and someone mentioned the Teacher Grant Program. In its eighth year, the program has given out more than $44,000 to teachers, funded by Maps setting aside one penny for every debit card transaction for each of its members. Karns created a video highlighting the classroom's needs and submitted it to Maps. She was one of dozens of teachers in the mid-Willamette region vying for the grant money, and between schools in districts like Salem-Keizer and Silver Falls, her project faced an uphill battle in garnering enough votes to finish in the top 10. 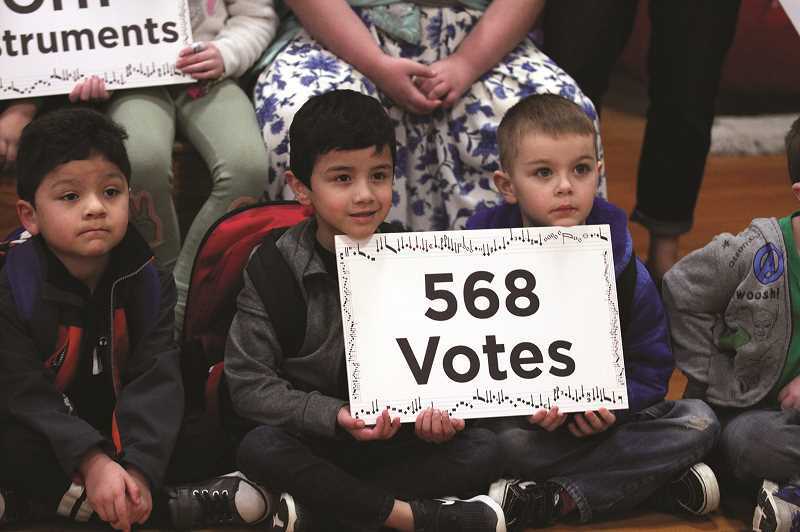 Gervais Elementary did its best to get the word out during the two-week voting period in December, but the vote totals were kept in secret. The results were slowly released over the course of January through posts on Maps' Facebook page. 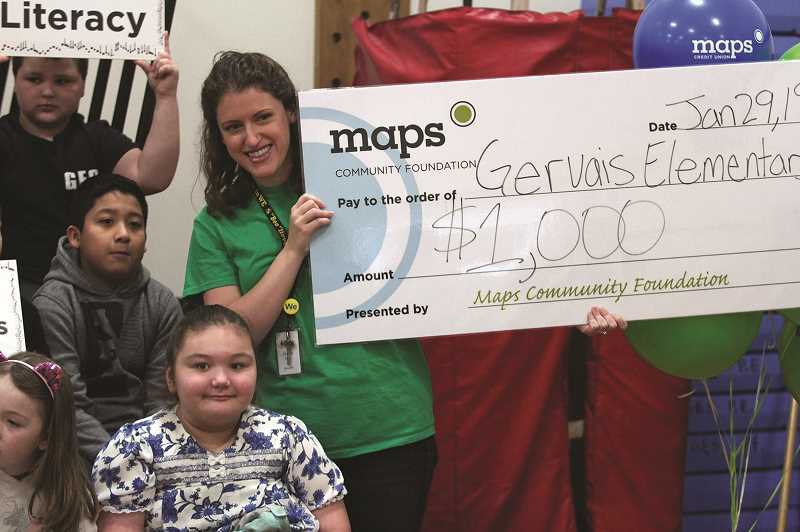 Each day that passed, Maps would release another video of another classroom earning grant money, and it seemed destined that small Gervais district would be overlooked in favor of larger communities that could rally more people to their cause. That is until Jan. 30 when Maps announced its 10th and final grant recipient: the classroom project that received the most votes. At the top of the standings stood Gervais, which garnered 568 votes — over 150 more than the second-place project. "I was surprised," Karns said. "When I stared at this school, everybody talked about how everyone is a family and everyone supports each other. This is just a good way to see that come through." Karns will be able to use the grant money to add a few more Orff instruments to the classroom, along with the specific mallets needed to play them. It's not nearly enough to replace every instrument, but it's a start, and Karns is already applying for additional grants with the Oregon Education Association to get more drums in the classroom and make sure the halls of Gervais Elementary School resonate with the sound of music. "The Gervais community coming together — even though our school district is small and in an out of the way place, it's just a great place to be a teacher and a student," Karns said. "We're excited to highlight that."